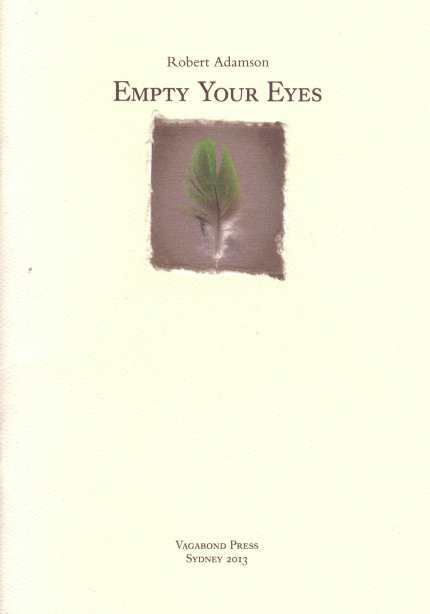 Empty Your Eyes by Robert Adamson, Vagabond Press, Sydney, NSW. 2013. “The eye altering, alters all”, Robert Adamson quotes William Blake in the front of his new chapbook Empty Your Eyes, a line that characterises the poet’s work as his perceptions have matured and developed throughout his career. From the startlingly raw prison poetry in the early books to the romanticism and the stunning reflections on life on the Hawkesbury River in the multi-award winning The Clean Dark, Adamson has seen many things in his life most of us never will and expressed them through his poetry beautifully. Published as part of Vagabond Press’ impressive “Rare Objects” series, Empty Your Eyes captures the essence of Adamson’s expert command over the lyrical that has been the basis of much of his reputation. I see this chapbook as one of perceptions, which range from those of a young Adamson to an older, more mature Adamson. an attempt to ease her pain. Adamson also reflects on several figures he knew as a young poet in the sixties, such as Charles Buckmaster and Michael Dransfield, as well as the works of other contemporary Australian writers such as Sonya Hartnett. The personal nature of this poem, as well as ‘Michael Dransfield in Tasmania’, written upon years of reflection and calling on Adamson’s friendships and interactions with both poets, are an important contribution to the history of Australian poetry and the study of the so-called “Generation of ‘68”. We see how Adamson’s perceptions have changed since the sixties and seventies, and I believe there is almost a subliminal questioning of how the views and works of the likes of Buckmaster and Dransfield may have altered, had they not been swept away so young. It is difficult to disagree with Adamson on this, as Dransfield would have likely altered his views and ambitions as he developed and matured as both a poet and a person. Luckily, we have been able to see Adamson enjoy a long and sustained career in comparison. I think Adamson’s work in Empty Your Eyes would rival his very best, showcasing poems that preserve people and places, and even through the eye altered by time, he breathes life into that which has passed. The Dransfield poem, built on excellent imagery, is a lovely portrait of a young poet living for poetry, finding poetry in each waking thing. In it, Adamson references things such as James McAuley and ‘the loft’ where Dransfield lived with his girlfriend. Prose poems open and close the chapbook, the title poem written after French poet Pierre Reverdy providing a brilliant note to end on. Through all of his changing perceptions over time, Adamson has remained an exceptional poet, and there is a certain solitude found in this book, as if he sees all things now in a clearer light. A beautiful (though only slim) volume of lyrics, we are fortunate to have Robert Adamson, one of the finest and most interesting Australian poets we have produced this century. Empty Your Eyes is a rewarding book and a fine addition to Adamson’s impressive bibliography. This entry was posted in Empty Your Eyes, Issue 11, Robbie Coburn, Robert Adamson, Vagabond Press and tagged Charles Buckmaster, Generation of ‘68, James McAuley, Michael Dransfield, Pierre Reverdy, Rare Objects, Robbie Coburn, Robert Adamson, Saint Augustine, The Clean Dark, The Great Auk, vagabond press, William Blake by Mark Roberts. Bookmark the permalink.